Yeah, that happens quite often, even in the actual sets. There's an old story that Birds of Paradise's art was originally painted for Volcanic Island. The art didn't fit, so they made a new one for Volcanic Island. They created Birds of Paradise to fit the artwork. Rampaging Primosaur: I love this idea: in a set that focuses heavily on "abilities matter", the "basic lands matter" ability is right on theme. I would like to see more "basic lands matter", if there's room for them in this set. I dislike excessively mathy cards, and that particular ability seems like too much. 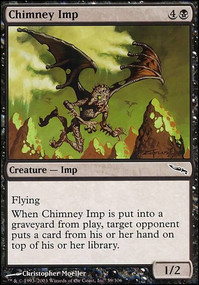 Let me suggest a replacement: Name it "Rampaging Imperiosaur", cost it at , and make it a 5/5 with Trample and "Spend only mana produced by basic lands to cast Rampaging Imperiosaur". Sidenote: The classic Imperiosaur does have an ability, and much to the surprise of new players, is not affected by Muraganda Petroglyphs. This is unfortunate because it would have been a great candidate for reprint. If you use this Imperiosaur ability on other creatures, I would give them another ability so it's unambiguous. Rapt Hatchling: This is another situation where you're hamstrung by art. This looks more like a sorcery than a 2/2. Razor-edge Thicket: I first read this as Razorverge Thicket. I love the ability on this card. It could probably be cheaper, because the opponent can just make creatures Primal to avoid it. This brings up the next question: where are all the 2-toughness Flying Primal creatures? A Gatherer search for Core Set 2019, Flying, and Toughness <= 2, gives about 10 creatures. Rebellious Torcher: Absolutely not. This card would be format-warping: that kind of repetitive land destruction, that early in the game would quickly put people to 0 lands, hoping that there's a Shock and an untapped land in their top 10 cards, or else they lose. Many games would end with that creature as the only permanent on the battlefield. Saber-Spear Ambusher: This card has an unfortunate interaction, where it can first strike, and then bounce itself before the opponent hits them. Sacrificial Dirk: It's a costly equip for a Gorgon Flail. Savannah Prowler: Just give it Haste and First Strike, and save the craziness. It would be in good company with Cerodon Yearling, Skyknight Legionnaire and Sky Terror. Shielding Heron: That hurts because I really enjoyed Muck Drubb. The ability was made useless once they decided that it can't be used to counter spells for invalid target. You don't want to make a card that's useless before it gets to paper. 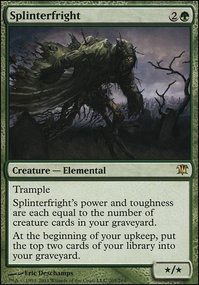 Spigot-shell Mollusk: Beautiful art, it's sad that it's being used on a card few people would ever play. Maybe its ability should be free? I'd compare it to Death Cultist. Spiral-shell Spawner: was mill going to be a theme for blue? Stutter-spell: Significantly more powerful than Runeboggle. As a general rule, tacking "Draw a card" on to something costs . For the card I mentioned, it's Force Spike. Looks like you're tacking it on to Mana Leak, so the cost should be . Submerging Shonisaur: I can't be sure, but it's probably too big to have protection, and evasion built in. Swift Pterodrone: Are they called Pteron, Pterodon, Pteranodon, or Pterodrone? I think I've seen all of them. You and Wizards need to pick one and stick to it. Tar Pit: The Maze of Ith effect is very strong. Mystifying Maze was meant to be a fixed version of it. Territorial Lizodon: It seems too cheap to have the option to be a Canal Monitor. Should probably cost 5? Vaerin Infantry: Seems weak. Can it be pumped to a 2/1? or 2/2? Wantan Disaster: Check your spelling. Xenophobia: The ability "Protection" has been deprecated. 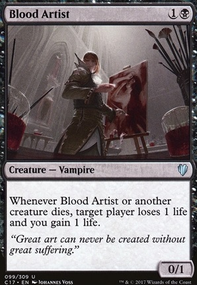 And if it wasn't, this would be crazy powerful in this set, as creatures with no abilities already have few redeeming qualities. This card needs a complete redesign. I'm sorry to be the one to tell you this but the combo you're trying to set up doesn't actually work. 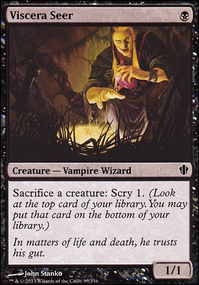 Supernatural Stamina cares about the creature not the magic card so the second time you sacrifice the Treasure Keeper it'll be a different permanent and won't come back. I couldn't find where in the rules it says this but when you think about it Bile Urchin or Death Cultist plus Supernatural Stamina are both instant wins that would break modern or even legacy if it worked like that. 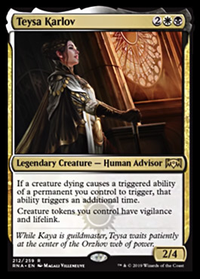 The most similar combo you could pull off in standard I can think of is with Naru Meha, Master Wizard that's coming in Dominaria. Target the Yahenni, Undying Partisan with Supernatural Stamina then cast Naru in response to copy the spell except target herself. Let it resolve and sacrifice her. She'll come back and you can copy the spell again. This will do nothing unless you have a payoff lying around like a pitiless plunderer or ashes of the abhorrent. Also remember this doesn't work with Defiant Salvager as he can only sacrifice as a sorcery. If you want to cast your whole deck tho I guess Sunbird's Invocation and Brass's Bounty or Paradox Engine and any mana-dork would be the place to start. Anyway have fun chasing the combo dream my friend. lukas96 on That's not how you use Death's Shadow! LordNeely on That's not how you use Death's Shadow! 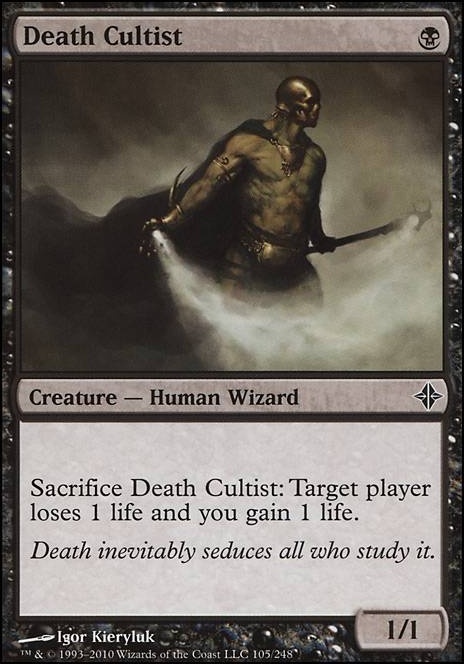 LeaPlath honestly Death Cultist is probably a more effective (and cheaper) card than Death's Shadow but im also trying to use a commonly used card in an uncommonly used way lol. Nice deck idea, seems fun. You might consider swapping out Death Cultist for Children of Korlis as it would allow you to reset your life total to try again. With that in mind you should look at Necropotence with Reliquary Tower and Thought Vessel. 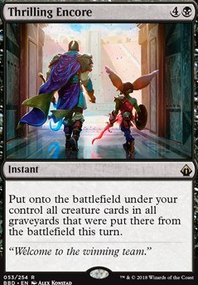 Besides, why not run and be fueled by the most sinister card in magic, the only one whose activation cost requires you to "sacrifice children"?